This living space is so large that it warranted two fully separate, but matching, sliding roofs. Each can be used as desired, and each takes about 30 seconds to open. A key design innovation with this system is that each 1600kg dynamic element slides underneath the adjoining fixed roof, rather than over it as is typical. Needless to say this caused challenges with rain water management, but these issues were solved with our custom stainless steel guttering solutions, some of which are mobile and move with the roof itself. This solution appeased planning permission concerns about overall height that may otherwise have stopped the scheme. 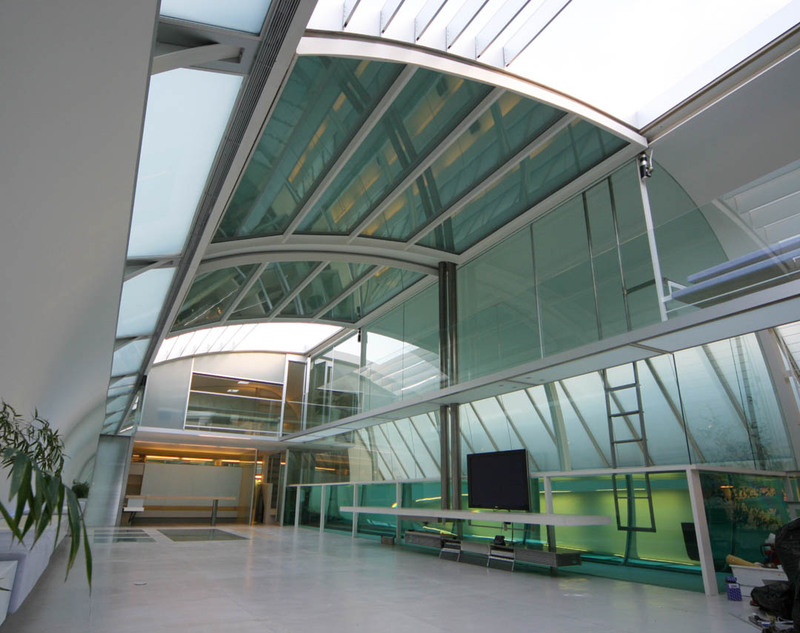 Each roof consists of two curved end frames, between which are four flat double glazed units. This is a simple way to create a slight arc to match that of the rest of the building without the expense of curved double glazed units. When both roofs open, they do so towards each other to keep a centrally balanced aesthetic to the room, whether the roofs are open or closed. Their operation can be electrically synchronised to move as one, or be separately controlled. The planners also added requirements with regard to privacy. The static holes are fitted with angled blades concealing views from certain angles whilst still allowing light to flood in. Complex access issues for these roofs meant the entire installation was hand built inside the room below. The assembled frames were lifted from the floor with chain hoists secured to the ceiling two storeys above. The client was keen to see some engineering detail, so the drive motor is fully visible above the glass balcony. Battery backup systems and full duplication of the drive system are amongst optional equipment we can add to moving elements. This gives peace of mind that the roof can be closed in the rare event of power or system malfunction.